KSR story: Will I get eaten by a Lion? 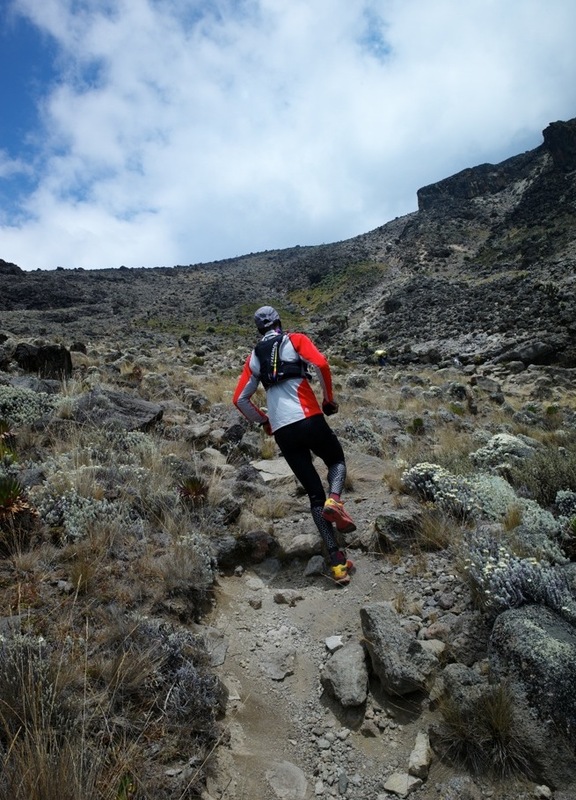 Chase your dreams in Africa on the Kilimanjaro Stage Run. The reality is there are no lions on KSR, and to the relief of most, and disappointment to a few, no dangerous wildlife to encounter at all while running the eight-day, 260-kilometer loop around the base of Tanzania’s Mount Kilimanjaro. Known as the “Roof of Africa,” Kilimanjaro is the world’s tallest free-standing mountain. However, you can try to outrun the old ladies balancing bundles of branches on their heads. Prepare to be humbled by the strength and stamina of the bibis (grandmothers) who carry anything and everything on their head (except babies, which go on their backs). I witnessed this first-hand on day six of the KSR three years ago. We were about 25km into the 35km day, trudging up a steep switchback trail to the ridge above the valley formed by a tributary of the Karanga River. 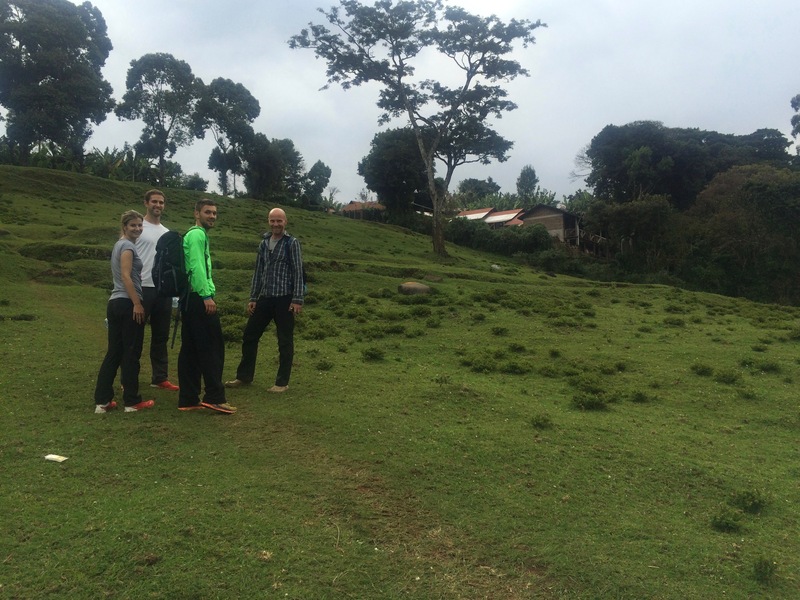 It is one of many such valleys we crossed, formed by runoff from Kilimanjaro‘s iconic snow-capped peak. We passed an old woman, no more than 5 feet tall, who looked at least 75 but seemed ageless in her energy. She carried a load of branch cuttings on her head up the steep slope. 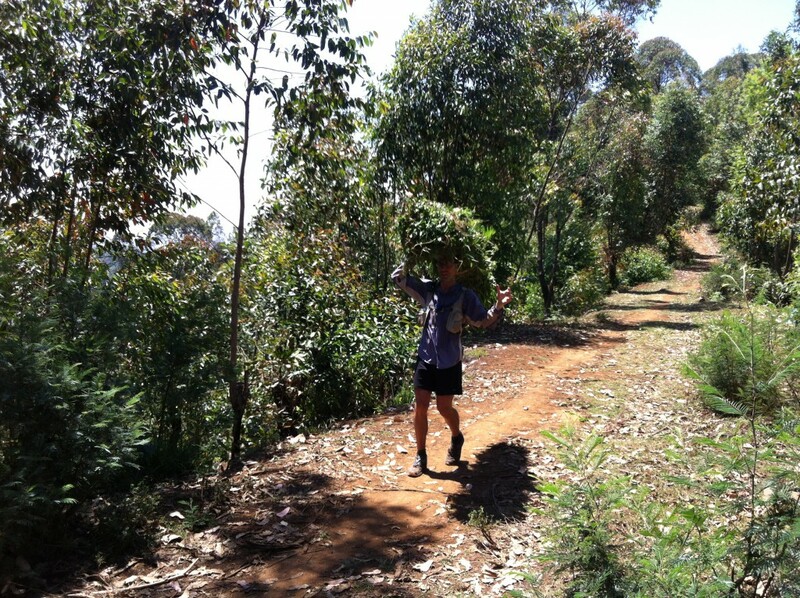 As we ran past, our lead guide and Tanzanian local, Simon Mtuy, offered to carry her bundle. In one motion he lifted the branches off her head, placed them expertly on his own, and charged swiftly up the hill. With her burden lifted, the bibi walked much faster and was keeping pace with us “runners.” While my legs screamed with fatigue, my ego forced me to pick up the pace so as not to be passed by grandma. Reconvening on the ridge, another runner in our group asked if he could try to carry her bundle on his head. The woman obliged. But it required our assistance to mount it and both his hands to stabilize the more than 50-pound load as he walked along. Maintaining his balance while walking 10 feet on flat ground was a challenge, much less a half-mile uphill trail! After many laughs and a long good-bye, the bibi skillfully placed the bundle back on her head and wandered along the path into the forest as we all stood flabbergasted. KSR runner attempting to carry an old woman’s bundle on his head. Such serendipitous encounters in which tourist runners and locals meet—equally hot and tired and sweaty from the day’s exhaustion—are what make the KSR so special. Going where other tourists rarely travel, Simon designed the KSR to be more than just a physical adventure. He designed a culturally immersive experience where visitors see how Tanzanians live, work, and play on a daily basis – all while passing through beautiful and varied environments all around Kilimanjaro. Running though tropical forests, around coffee and banana farms, across open savanna, and on well-worn footpaths between villages, to name a few, make each day different. The KSR is more than about the running and certainly not about speed. It’s about discovery, of learning about life around Kilimanjaro, running as a team, supporting each other and sharing each day’s special sights, sounds, and smells. The route takes runners to remote outposts, miles from roads or any signs of modernity, where one might pass a farmer in his field, a gaggle of school girls in their neatly pressed uniforms, or perhaps a young Maasai in full regalia (invariably talking on his cell phone). Everyone we met seemed genuinely happy to see us. Some just wave and smile. Others jog with us a few hundred meters, laughing with joy at the opportunity. A few bold people might stop us and, looking stern, demand to know what we were doing. (After all, it’s not every day one sees a bunch of exhausted wazungu (white people/foreigners) in running gear emerging out of the woods in a remote corner of Kilimanjaro). After an exchange of translated Swahili and broken English, they invariably would be happy to learn that we came to see them and their home region, and proud that we would come so far and run such distances just for that purpose. With a hearty, “karibu (welcome to) Tanzania!” they would send us off like an ambassador granting his official approval. Exchanging thank yous and broad smiles, we would resume our run, curious as to what unique adventure awaited us on the trail ahead. You won’t encounter lions on the Kilimanjaro Stage Run, but to find out if you’ve got what it takes to outpace a Tanzania grandma carrying 50 pounds on her head, contact Simon and his team.